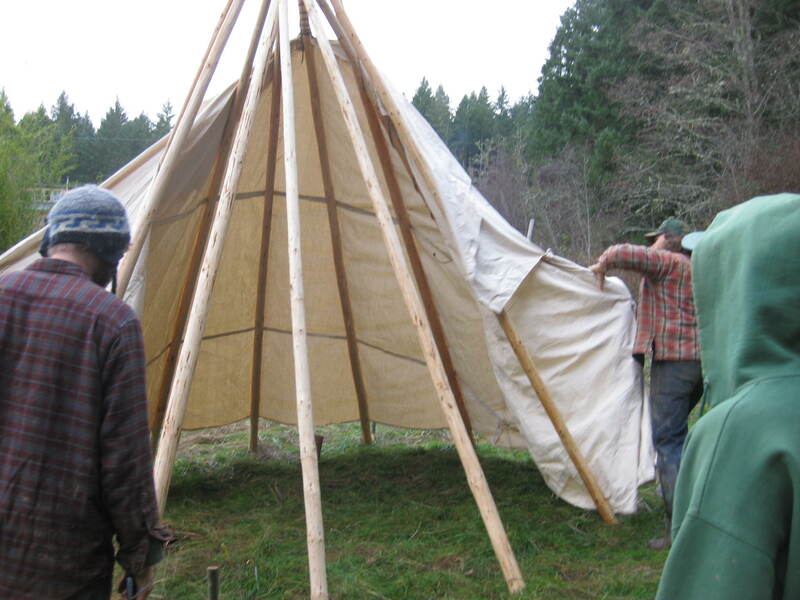 For my independent project I made a tipi. A tipi represents all of the aspects of natural building and is an empowering structure that provides both a beautiful shelter and mobility. A sustainable and portable shelter may become increasingly important in a world where the reality of climate change may lead to the future displacement of people. 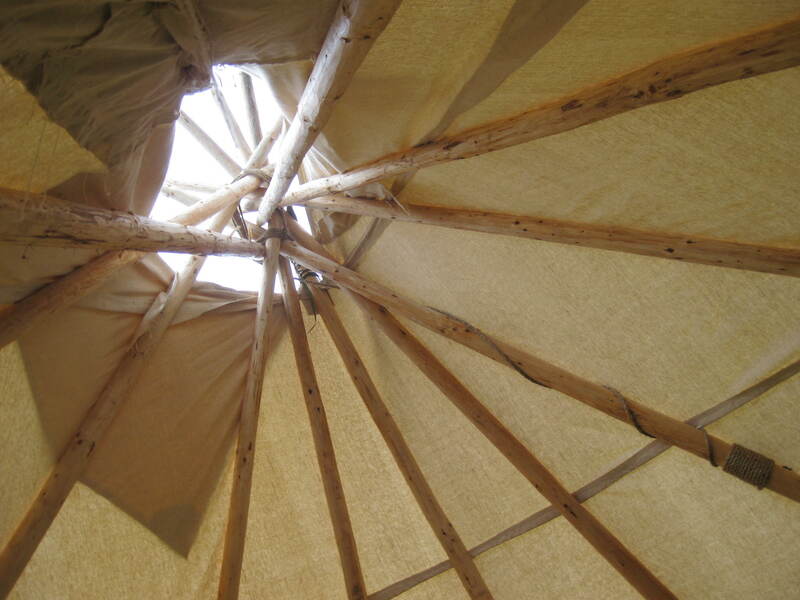 The perfect simplicity of the tipi requires a minimum of materials and can be done without the use of industrial products. I followed a pattern in Reginald and Gladys Laubin’s great (but insensitively titled) book The Indian Tipi to make my tipi. I used an old Singer sewing machine borrowed from a local community member to sew the cover. I harvested 13 twenty-five ft. long Douglas Fir trees for poles and stripped these of bark. 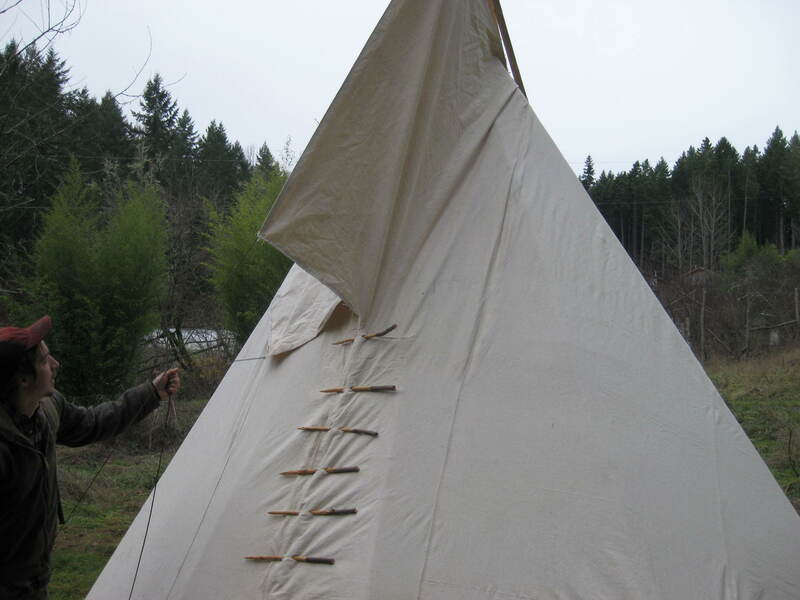 Sewing the cover is by far the most time consuming aspect in making a tipi, especially if done by hand. That said, it is not that technical and fairly easy to grasp. My experience sewing previous to making the tipi cover consisted of stitching a few patches onto pant knees. After completing the cover and stripping the poles, I whittled twenty stakes out of White Oak (any hardwood will do) to tie off tipi edges to. 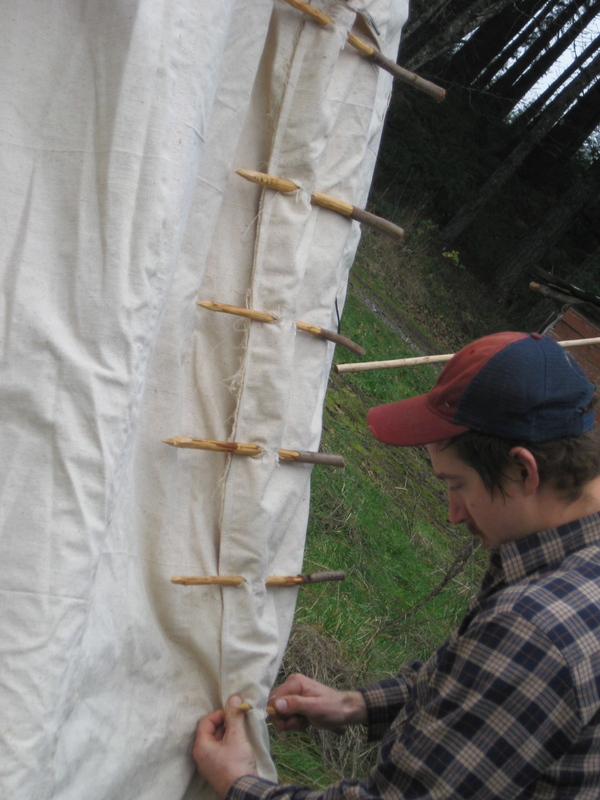 I then whittled 12 lacing pins out of Dogwood to be used to hold each side of the tipi together. 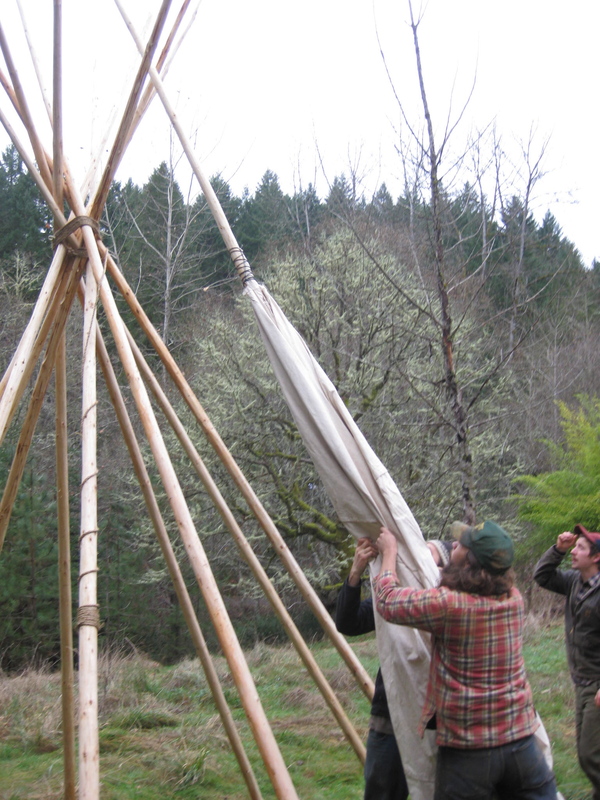 Setting up the tipi takes about an hour and is a job best done with two or more people but can be done solo. 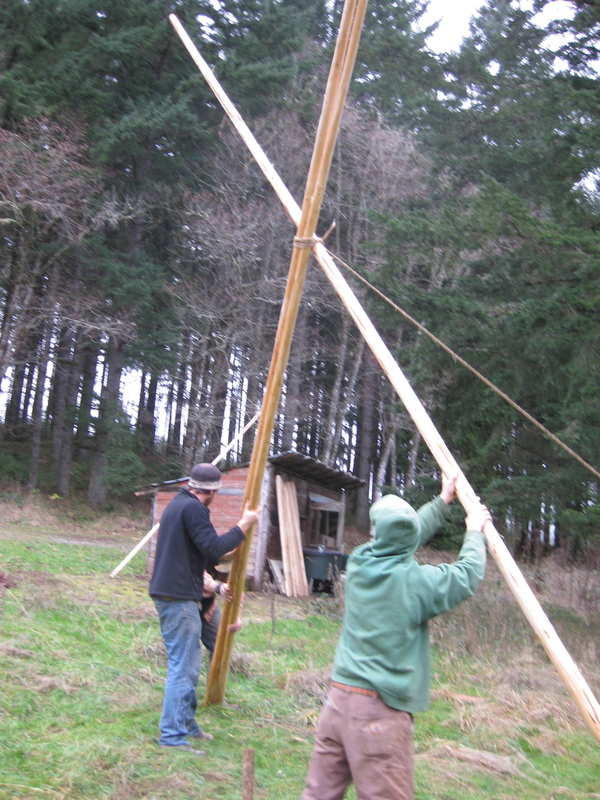 First a tripod of poles is lashed together on the ground and then raised. Each successive pole is laid equidistance from the center around the tripod. 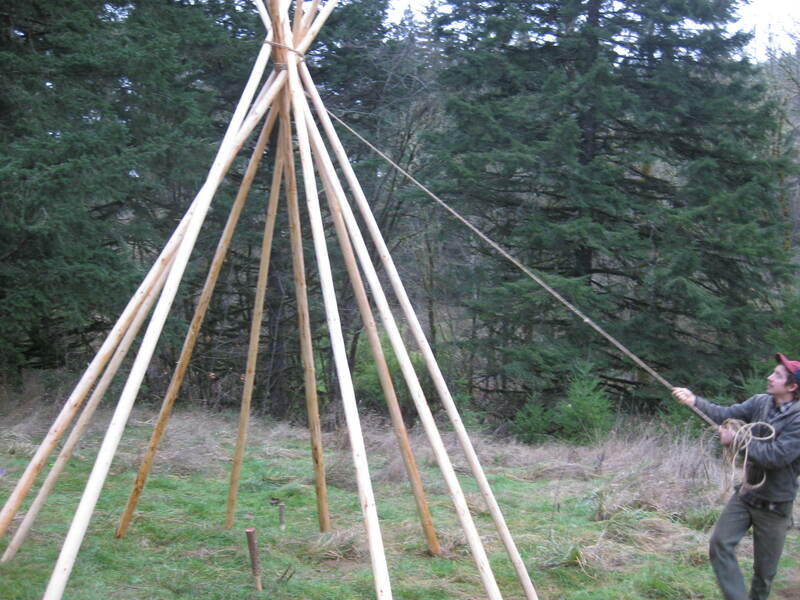 One inch rope was then walked (or run) around the tipi in a clockwise direction to secure the pole junction. 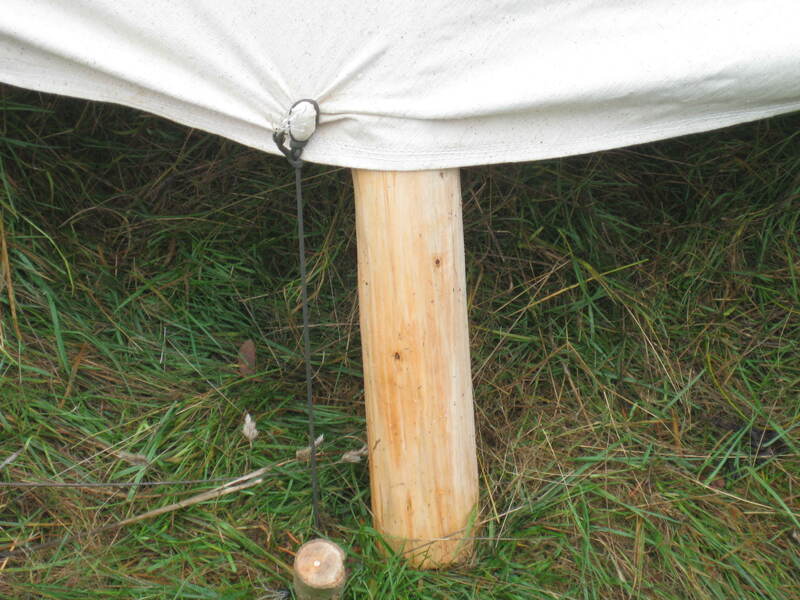 The canvas is raised with the help of a long pole and is wrapped around the wooden bones of the tipi. The canvas was secured by bunching the bottom around rocks and then staking these secure to the ground. 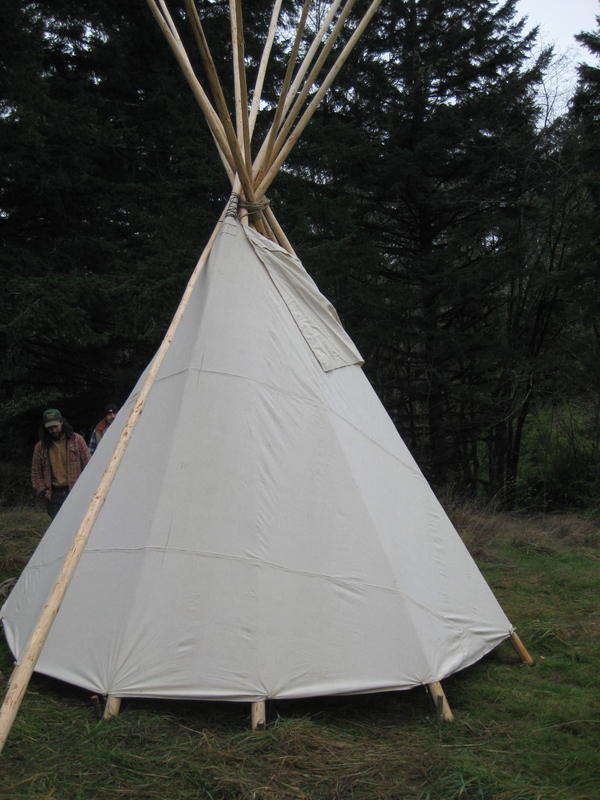 If we were living in this tipi year round we would also install a liner on the inside in order to reduce the cold draft and inspire the warming fire to vent vigorously up and out! Receive more updates on student projects, natural building diy and other things sustainable shelter related by signing up for the email list below. This entry was posted in Uncategorized and tagged aprovecho natural building, Natural Building, natural building internships, natural building school, natural building workshop. Bookmark the permalink.